The advances in veterinary medicine within the last five or ten years are really astounding. One of the most rewarding aspects of my role as a veterinary specialist is to make people aware of all of the new treatment options available to pets. That’s why I was so pleased to get a letter from Deb Ruzycki from Virginia Beach. She wrote to Pet 411 because her 17-year-old domestic shorthair cat was diagnosed with hyperthyroidism, which is a common affliction in older felines. Hyperthyroidism occurs when the thyroid gland produces too much thyroid hormone, which causes a significant increase in metabolism. This is usually caused by a benign tumor on the thyroid called an adenoma, although in rare cases this can be malignant. The most common signs in cats are weight loss, increased appetite, hyperactivity, failure to groom and increases in water intake and urine output. If left untreated, it can be fatal. So what was it about Deb’s letter that sparked my interest? It’s because there’s a highly effective treatment for cats with hyperthyroidism that some people may not know about. This treatment is called radioactive iodine or I-131, and it can completely cure hyperthyroidism. 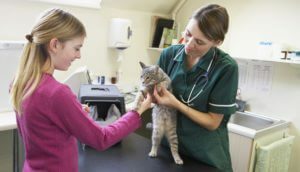 As a matter of fact, a recent study suggests cats may live up to four years longer with this treatment compared to oral medications. I-131 is a simple, single injection, and more than 94 percent of all cats who receive this treatment never need to be treated again. I-131 is a form of iodine that has been made radioactive. When injected into the body, a large percentage of radioiodine accumulates in the thyroid, while the rest is excreted in the cat’s urine and feces. The radiation in the iodine destroys thyroid tumor cells, treating the hyperthyroid condition. It sounds a little scary but it’s actually quite safe when administered by an authorized veterinarian. Cats do need to be hospitalized for a few days after treatment to ensure the radiation safely leaves their bodies. The length of stay differs by state regulations. At BluePearl, we use this time for a little patient pampering in a quiet environment including background music and meals catered to the owners’ request. The downside for some is the expense. The price for I-131 can vary but because it requires only one treatment, it may ultimately be more cost effective than other options, which include medication, diet or surgery. The other potential hurdle is finding a facility that offers the treatment. There are several BluePearl hospitals that administer I-131, including our Greenbrier hospital in Virginia Beach. If you’re interested in learning more or would like to find a facility near you, I suggest talking to your family veterinarian. Radioactive iodine is just one example of the many innovative treatments available to pets. We in the veterinary profession love to educate caring pet owners about the many options available to them. So never hesitate to reach out if your pet is experiencing a health challenge. You may be surprised by the answer. Pet 411 is a new column that will appear on BluePearl’s website. Readers are encouraged to submit questions for Dr. Cathy Meeks at pet411@bluepearlvet.com.